Feelin’ the Love in L.A. 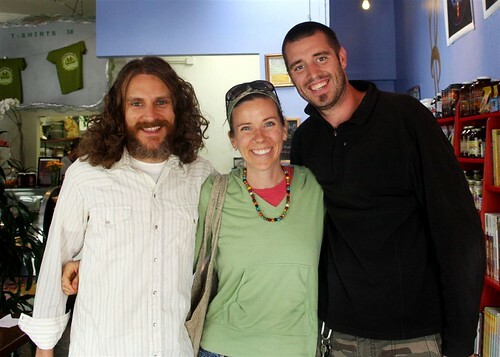 This week in L.A., we had the pleasure of meeting the owner of Euphoria Loves RAWvolution, Matt Amsden. Matt is also the author of RAWvolution. Be sure to check it out next time you’re in Santa Monica! 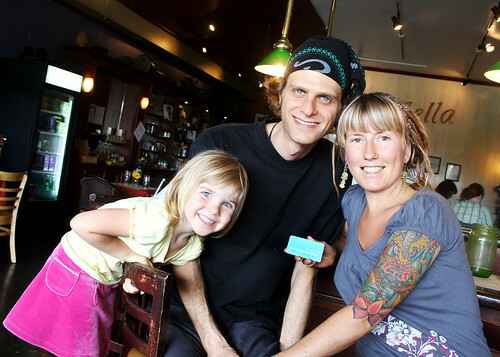 His restaurant also does raw food delivery (“The Box”) and will deliver nationwide. You can see Matt speaking on YouTube here. We also spent some time in Redondo Beach at Terra Bella, owned by the lovely Melissa Davidson. I’m still dreaming of their Coconut Curry soup. Wow. Check out the close up of Melissa’s tattoo here! I’ll be writing a full blog on our raw restaurant visits soon (including Cilantro Live! in San Diego)…complete with food photos, of course! Stay tuned! Entry filed under: Raw, Raw Restaurants. I found your site google-searching for a recipe for lentil dahl, which I’m making right now. A lot of great-looking recipes on your site, I’ll definitely be back! that salad sounds aMAZING below YUM! i really want to do the smoothie challenge. will you be doing another one?! do you use just a blender? Cocunut Curry Soup. Umm…sounds delish. You are making me long for a Raw Restaurant! We need one around here.